I’m a big fan of the high quality Art of Tea iced teas. They offer great flavor, bags that are large enough to make a generous pitcher of tea and very clear instructions on how to ensure that the tea turns out perfectly. The Art of Tea Passionfruit Jasmine Iced Tea is a flavor that jumped out at me immediately, since I’m a fan of anything that includes passionfruit. 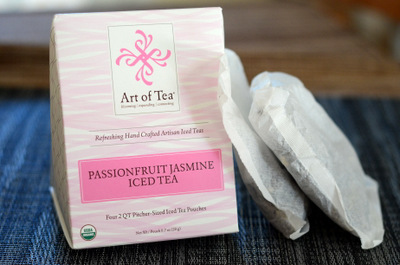 This tea is a blend of black and green tea with jasmine flowers, not jasmine tea. The flowers give the tea a very delicate, sweet floral scent that blends well with the floral notes of passionfruit. It’s slightly sweet on its own, but the flavors pop even more when you add a little bit of sugar to the mix. Since the flavors are delicate, this is once iced tea that might lose its refreshing essence if you over-sweeten it. One package makes enough for four 2-quart pitchers of tea, which should be plenty to get you through two or three hot weekends this summer!